Over and Big Think, Michio Kaku has posted a bunch of questions he wants fans to answer for a project he's working on. I don't know what the project is, but if Michio Kaku is involved, then it's bound to be awesome. So, considering that his questions are blog worthy, I thought I'd start a little meme. If you'd like to participate, all you have to do is steal the questions for yourself and answer them. Make sure to link here, and, if you want, post the link over at Big Think so Mr. Kaku can see what you wrote. Simple enough, right? I want to see the stars and other planets in my lifetime. I can't do that when it takes longer than a single human lifetime to get to the nearest star. Just imagine seeing other planets and maybe finding a habitable one. It'd be nothing short of amazing. In science fiction, you sometimes see futures where we've cured most of the major human ailments, or, at the very least, have come up with extremely effective ways to fight off cancer and so on. For me, this is a must have, since I'm a cancer survivor and have an unreasonable amount of compassion for people who are suffering diseases and ailments that we should have cures or reasonably effective treatments for. Sadly, we seem more interested in spending money to build things to blow one another up than to find cures or improve food production to combat starvation, etc. Star Wars (the original trilogy). It's the science fiction series I grew up with. How can I not include it as my favorite? I've seen Star Wars more times than I can count, and I will continue to re-watch it in any format I can get it in so long as I live. The series is beautiful, action-packed, fun, thrilling, and altogether wonderful. It's like childhood in movie form. It's pure imagination. What's not to love? The entire sequence in Star Wars: Return of the Jedi from the moment the rebel fleet appears above Endor to the destruction of the second Death Star. I remember watching that scene with awe when I was younger. It's visually gorgeous and it's just freaking cool. Say what you will about Ewoks, you all know the fight was entertaining. And how about that space battle? That's the one big difference between the originals and the prequels for me. In the new films, the space battles just aren't as impressive. They're CGed and seem too fake to me; I think they're a mark of how George Lucas has fallen into the CG trap with directors like Michael Bay. But the originals were just amazing. Yes, the visuals are flawed, and obviously so, but they are still so much more "real" than anything else. The miniatures used are beautiful. That's an impossible question to answer. It doesn't matter who I pick, I'm leaving someone out that deserves to be mentioned. 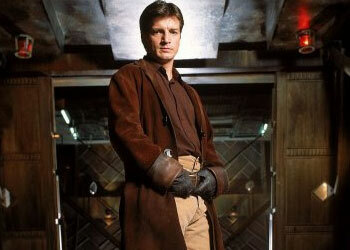 So, hopefully people will forgive me if I play the exclusionary type and pick Captain Malcolm Reynolds from Firefly. He's witty, gruff, and almost everything a good spaceship captain should be. For very personal reasons, the hypospray needle-less vaccine gizmo from Star Trek. I hate needles something awful. I can deal with being stabbed by them, but there's no reason for us to still have needles for administering vaccines and medicines. Where are my hypospray things? Hmm? Where?